The Squaw Creek Watershed spans 147,000 acres in Hamilton, Boone, and Story counties, with 93 percent being rural land. Squaw Creek is part of the larger South Skunk River Watershed. The primary objective of this demonstration project is to achieve nutrient reduction in the watershed with the involvement of multiple partners and stakeholders along with the use of cutting-edge technology. 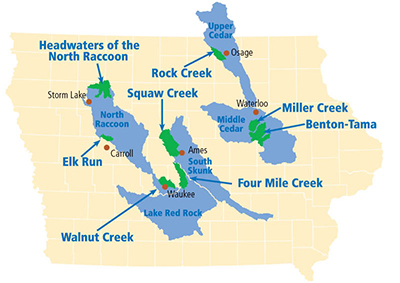 The Prairie Rivers of Iowa Resource Conservation & Development (RC&D), in cooperation with the Squaw Creek Watershed Management Authority, is leading this effort. Rural in-field practices include nutrient management practices and conservation practices such as increasing the use of cover crops and no-till and increasing soil organic matter. Now in its third year of implementation, the 20-year plan also calls for the installation of buffer strips and bioreactors. An additional component of this project is education and awareness of watershed issues for farmer, landowners, and urban residents. The watershed is also home to an urban WQI project.